…we’ll get that grunge out! Is the tile and grout in your expensive kitchen dirty and stained, and making you sad – or worse, embarrassed? Whether you have ceramic, slate, or porcelain tile, our certified tile and grout cleaning experts will return the luster of your kitchen or bathroom tile back to its natural beauty. If your fresh shiny tile and grunge free grout doesn’t put a smile on your face, you don’t pay! No questions. 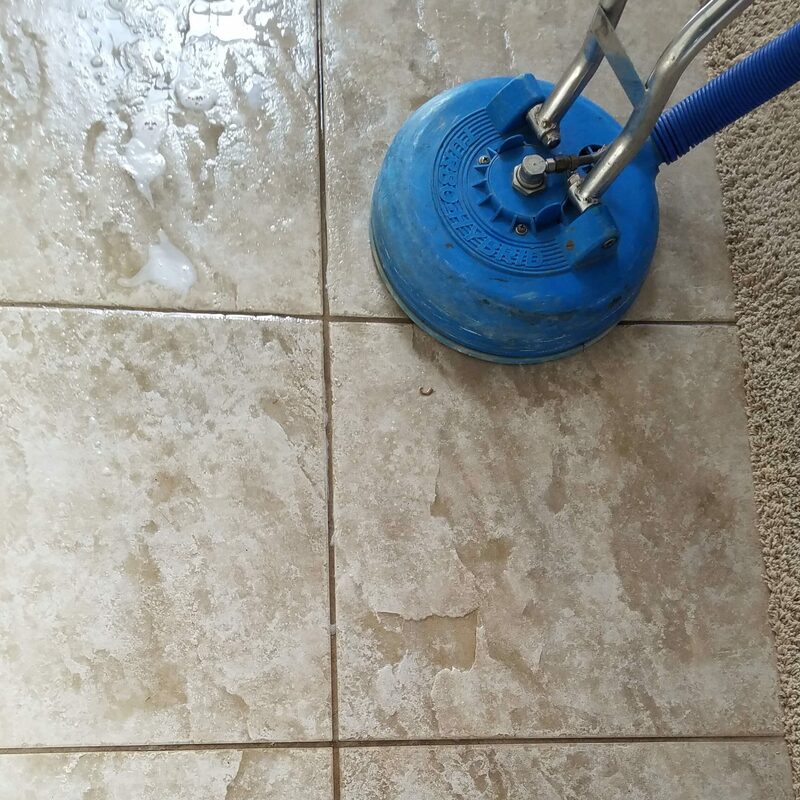 Every tile and grout cleaning service is backed by our 100% RISK-FREE, money back guarantee. 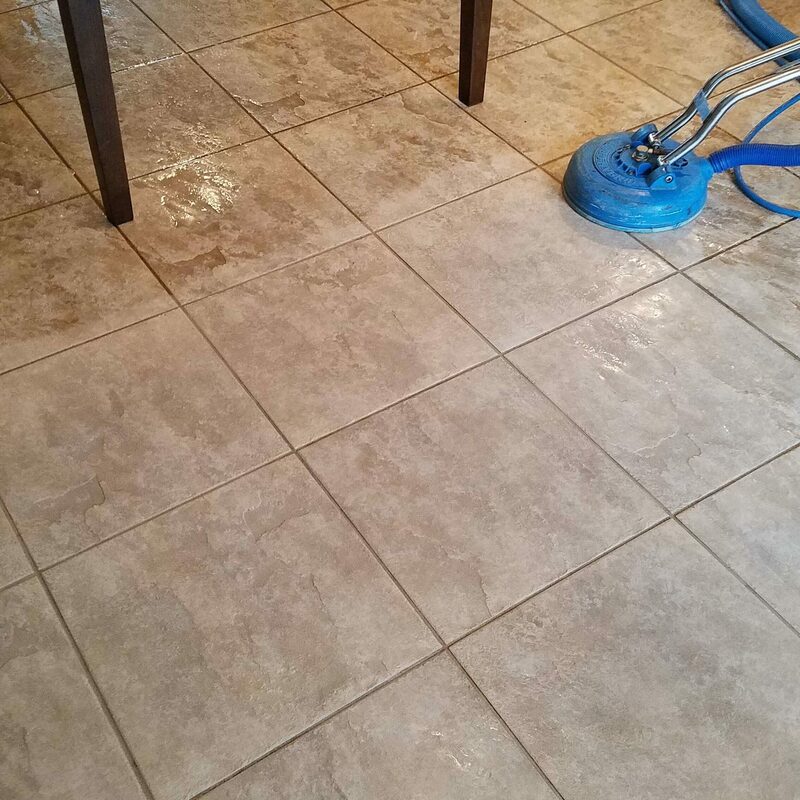 Our certified tile and grout cleaning experts use special cleaning solutions to restore your tile or stone’s natural sheen, while cleaning your grout without damage or fading. Once your tile and grout is revitalized to its natural luster, it’s time to seal the deal. Using clear or colored sealant will keep your tile and grout looking great – even after that first spill. We know you’re busy. Our flexible scheduling allows us to work with you and your hectic schedule to make it as convenient as possible for you. We have Green Cleaning Solutions that are safe for chemically sensitive people, children, pets and are friendly to the environment. Don’t wait for your tile to crack or grout to crumble. Freshly cleaned and sealed, your beautiful kitchen will be the talk of the town – or at least your family. Discover why over 3,000 satisfied customers have turned to Rainbow Carpet Cleaning for their professional tile and grout cleaning services needs. You were very thorough and persistent in removing the pet smell from our rugs. I really appreciated your following up, the flexibility in scheduling and your can do attitude. Thank you for working so hard. We will recommend you to all our neighbors. 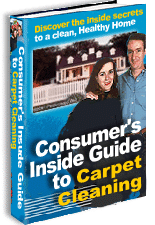 I credit the long life of my 22 year old carpet to yearly cleanings by Rainbow Carpet Cleaning. When I do have to replace my carpet I will continue to care for the new carpet using the services that Rainbow Carpet provides. We would like to thank you for the great job your employees did cleaning our carpet and sofa. Although they are young we saw that they are experts. They are friendly and willing to answer questions respectfully and with intelligence. Thank you for the great training you’ve given your sons and other employees. It means a lot to us. Thank you so much for your kind consideration and great job the great job you did on our carpets. It is always a pleasure doing business with you. Thank you so much for the excellent job that you did cleaning my carpets. Not only were you so very pleasant to work with, but the carpets were cleaned better than they ever have been before (by any other cleaners). I definitely will call you in the future. Once again I was very pleased with the service; in fact this was the best cleaning I’ve ever had. An added bonus is having such a polite, personable and trustworthy young man doing the work. The entire company is run very efficiently. We appreciate the quality of work and the timely manner in which our carpet problems were addressed. Rainbow is on the top of my list for cleaning and for referring to my friends and colleagues. Again thank you for your work. What a wonderful job. We will gladly recommend your services. Thank you very much for the wonderful job you did. We appreciate you quick attention to our carpet problems. How awful that would have been, but you saved the day once again. Thank you for your services. And we appreciate your willingness to negotiate, and understand our situation with moving. We are looking forward to future business with you. We were very pleased with the job you did and the crew who did it. They were quick and efficient. Thank you so much! I was extremely impressed with your work, but more importantly I was quite astounded with your customer service. Your office called several times to ensure I would know exactly when you would be arriving. When I was scheduling your office was attentive to my needs and very courteous and friendly. Great job! Thank you so much for the clean carpet. It was refreshing to walk in the house and have the carpet look so great and smell so wonderful. Thanks again. You were able to address effectively our cat odor problem. You explained every step of the process and did not give up until the problem was resolved. Thank you for your help. Thank you again for another job well done! Your service is fast, friendly and efficient, even when some problem areas need extra attention and you even came back for a second visit at no charge. Thank you! Just to let you know the carpets and furniture look better than ever. Your work is the best!!! Great job, I will plan on you for next year. And thank you for the senior discount. David cleaned our kitchen and stairway carpets. I just wanted to tell you how pleased we were with him, and his work. He did a better job than we’ve had done for some time. Plus he was very courteous and efficient. Thank you for an excellent job. We’ll certainly be calling you again. Thank you for the spot cleaning the carpets look great. I’m so relieved to have the problem fixed. What a joy to come home to a beautifully clean carpet. Impossible stains disappear when Rainbow Carpet hits the scene. The best job ever and we are so grateful. Your prompt service is always appreciated. Thank you very much! I think you did an excellent job. You were prompt and courteous and didn’t waste any time getting the job done. Thank you for the great job at a time of need! Thank you also for the senior discount. Actually having such nice employees was like having a bonus on top of the already great job. Thank you again! You guys did a great job on my hard to access upstairs and downstairs carpets. Thank you. Thanks so much for the wonderful job and for the discount. On behalf of Alpha Zeta we thank you for your continued support of Pi Kappa Phi at Oregon State! We called with a pet odor problem, and Luke did a great job taking care of it. He got rid of stubborn stains and finished right on time. It’s like we have new carpets. I’ll defiantly call you back for my next cleaning! Well, I have now met both your sons and I think they are just super. I like the way you follow up on your jobs, it makes me feel that you care. I will recommend you to everyone. I think you know what we think of your good work and your vast amount of knowledge. We also have learned to trust those that you recommend to us. Thank you for your great services. You did a fantastic job and you arrived when you said you would, which for a lot of companies is unusual these days. Thank you! Thank you for your prompt and excellent work! Luke is very courteous. I really appreciate the family business attitude and personal interest in my rugs. I like knowing who is coming into my home and feeling comfortable with their knowledge and commitment. Your boys have your future clients in mind, it lets me know that I am not just a one shot deal. Your quality work insures that I will call again! I just wanted to say thank you. Your guys did an excellent job and we were very pleased! And thank you for your special consideration as well…it was very nice and very appreciated. Thank you again. You did a fantastic job cleaning our carpets. We are really pleased! My carpets look great. Thank you so very much!